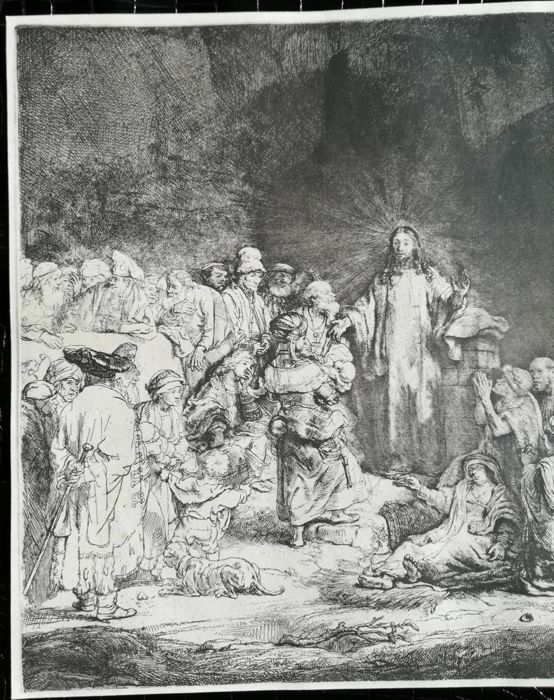 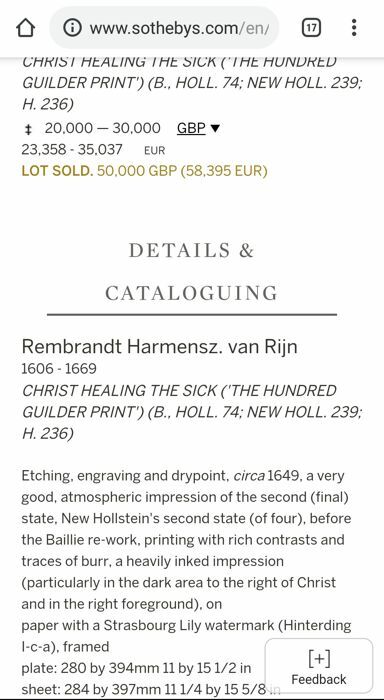 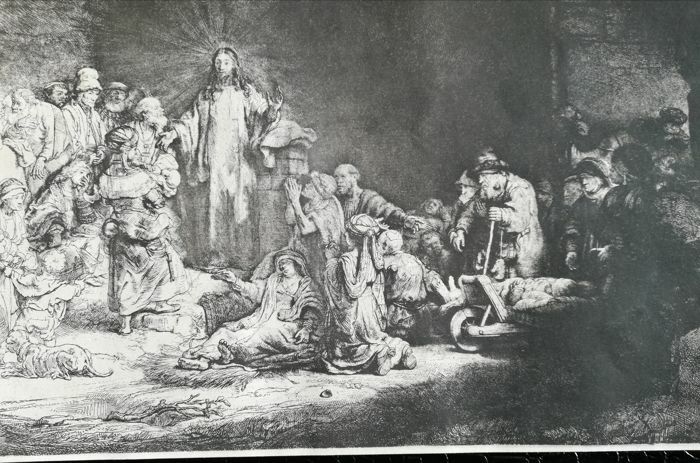 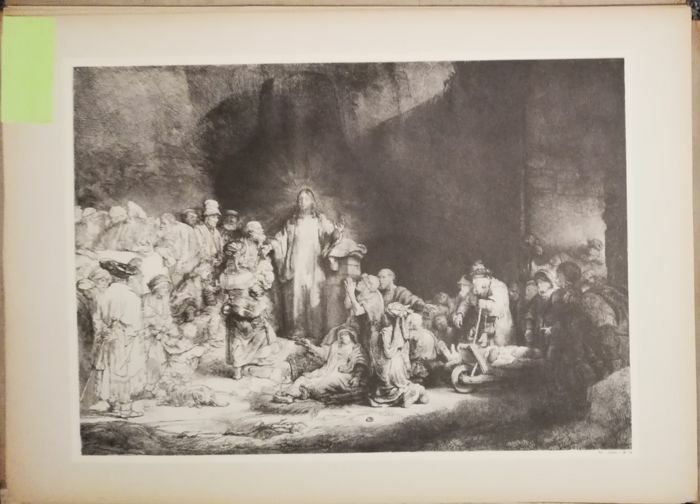 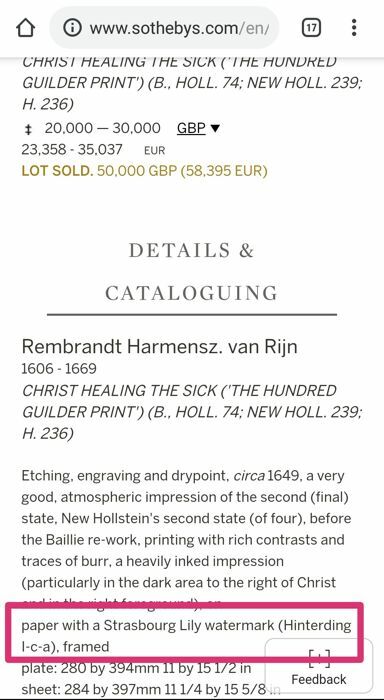 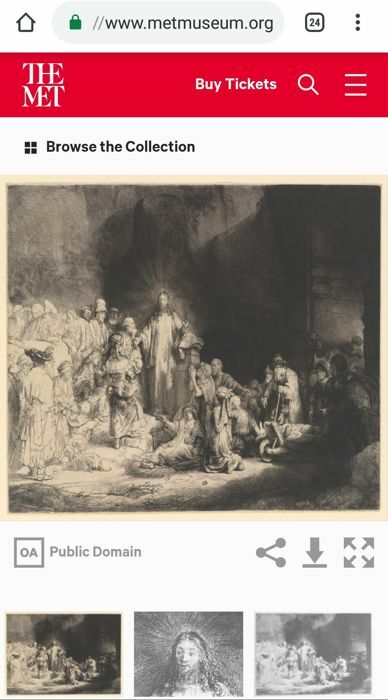 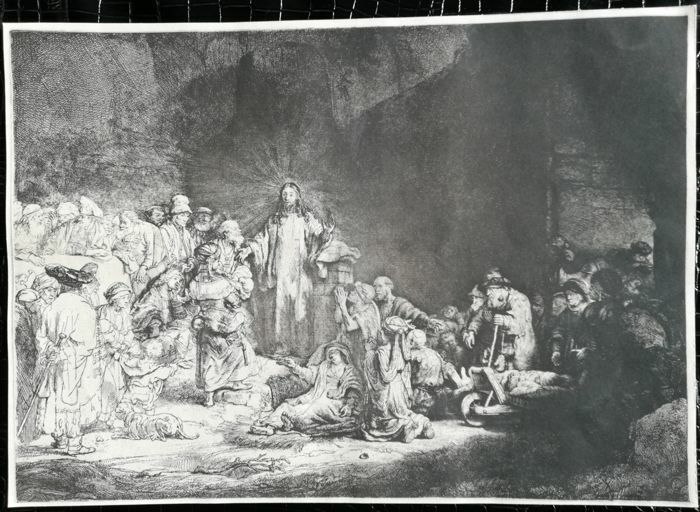 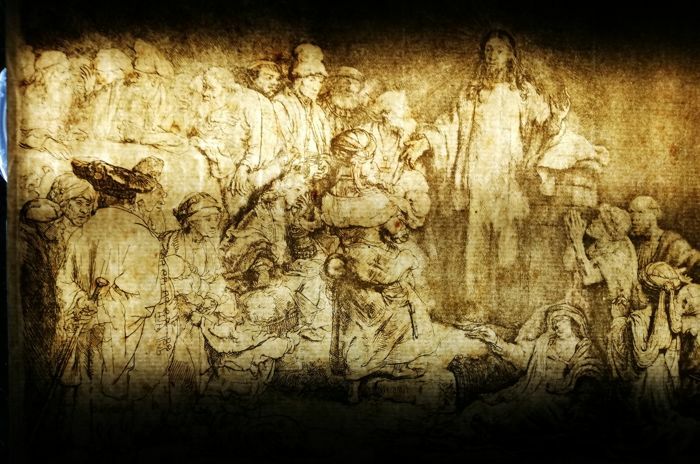 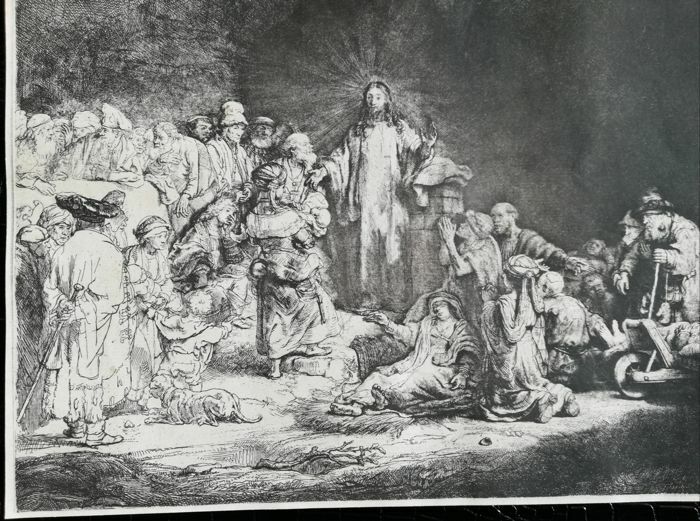 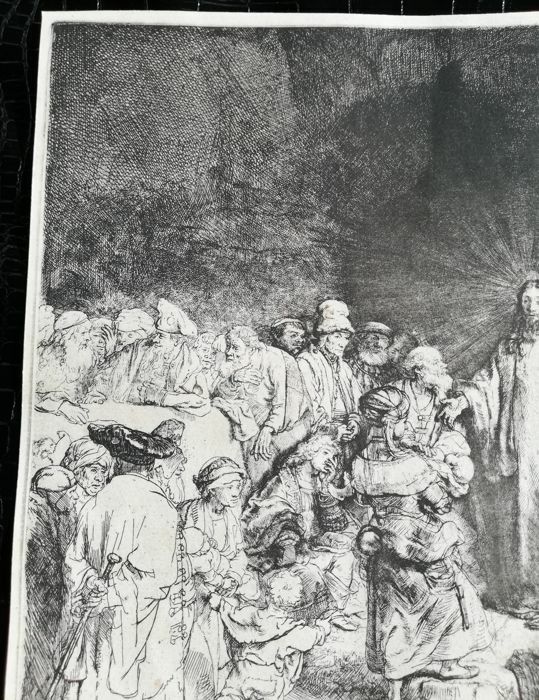 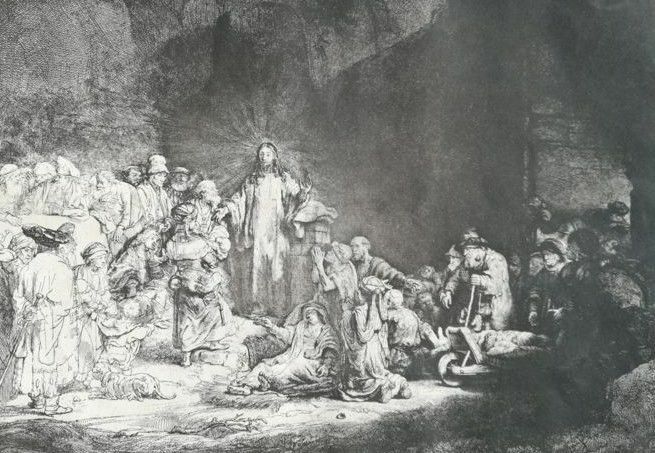 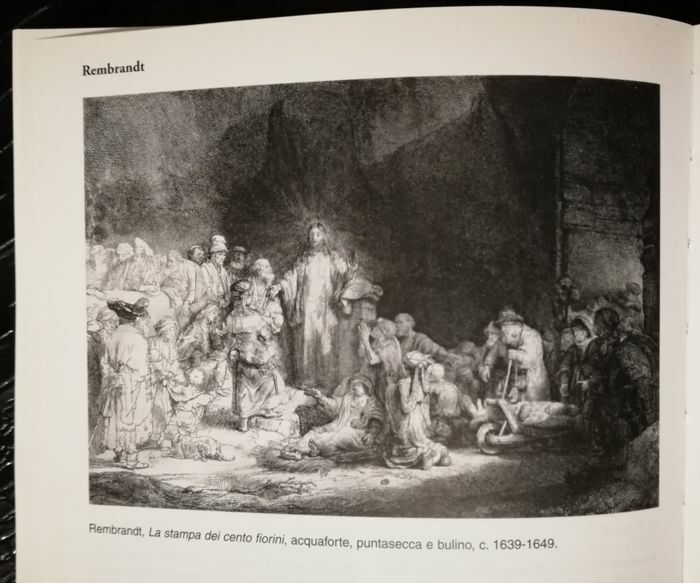 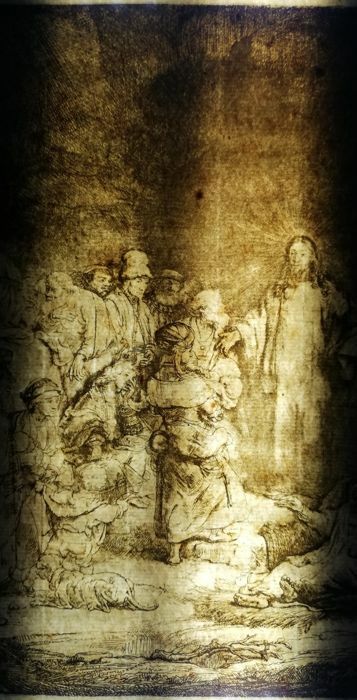 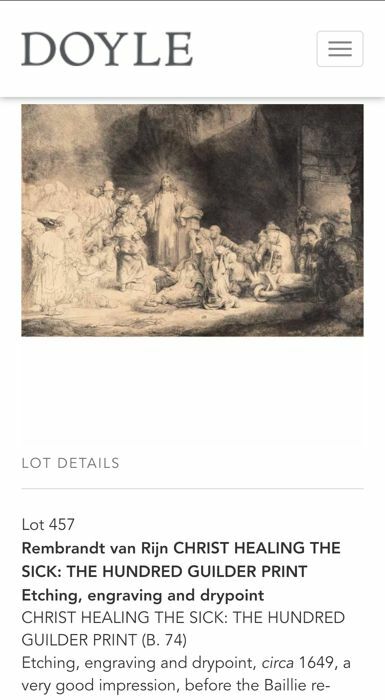 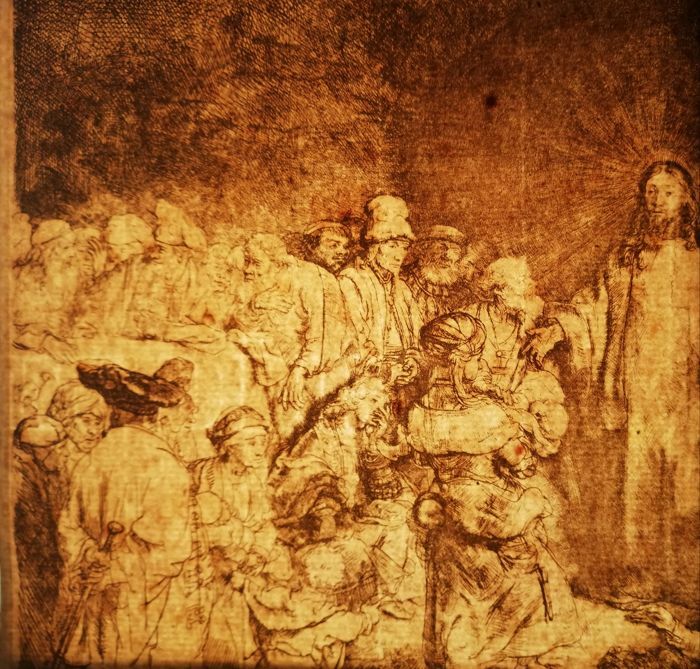 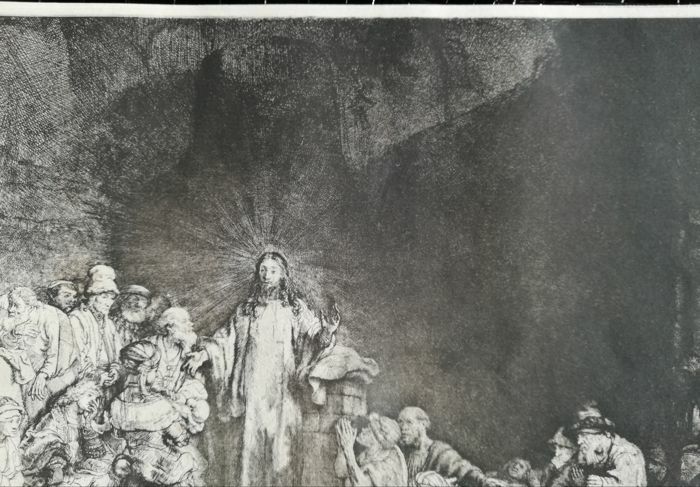 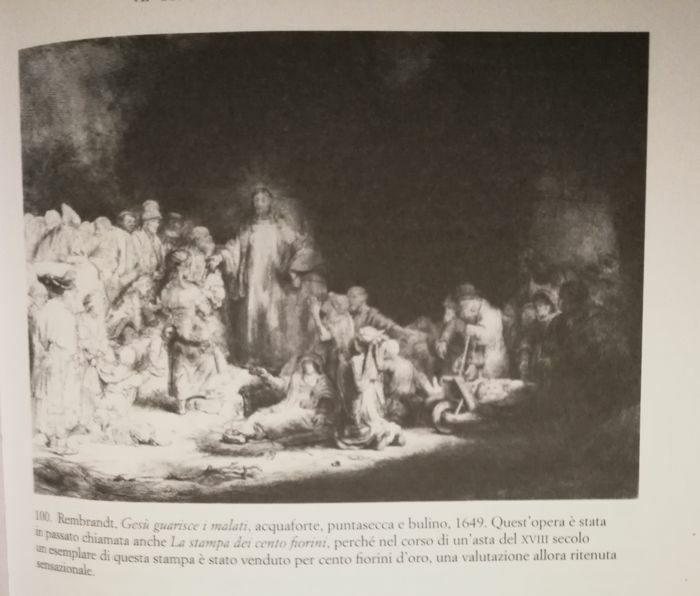 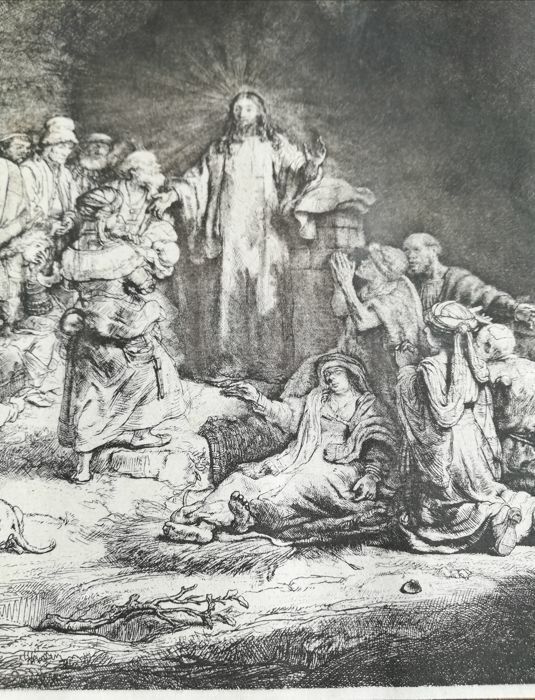 Rembrandt (Rembrandt van Rijn) - Christ Healing the Sick/The Hundred Guilder Print, 1649ca. 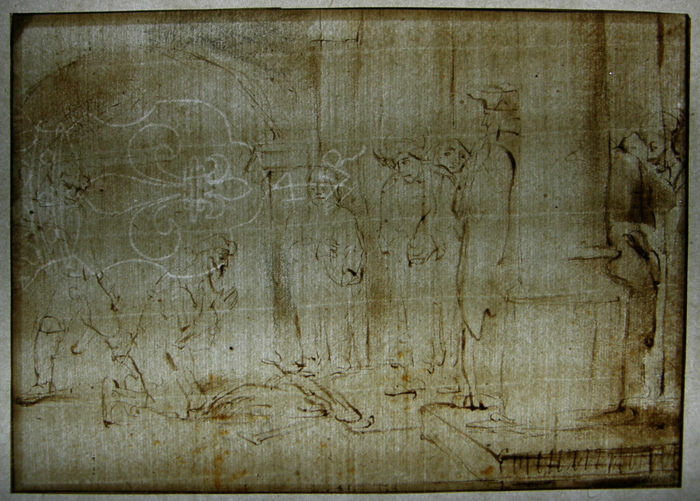 plate: 280 x 390 mm. 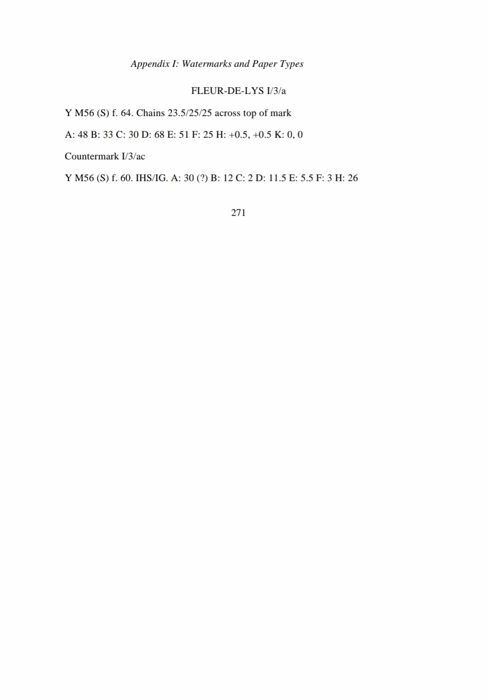 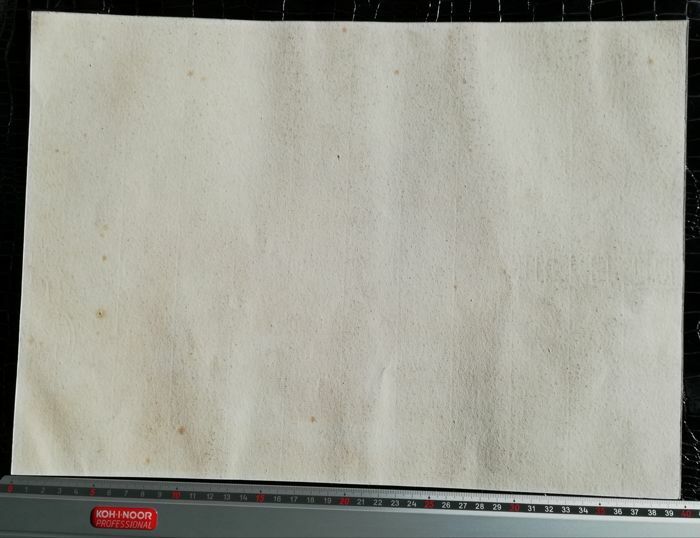 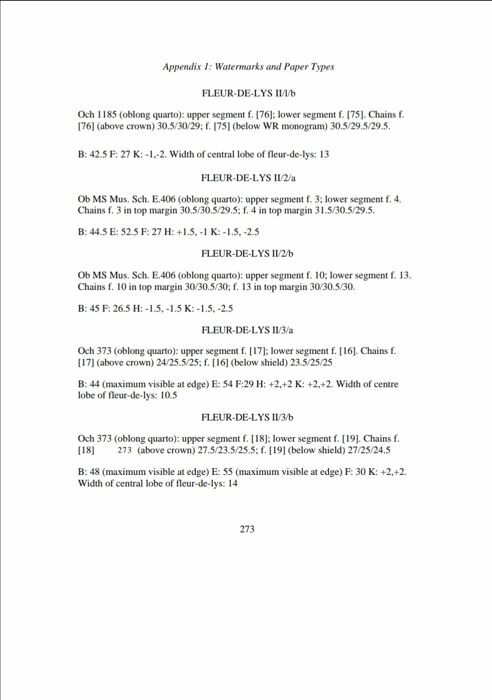 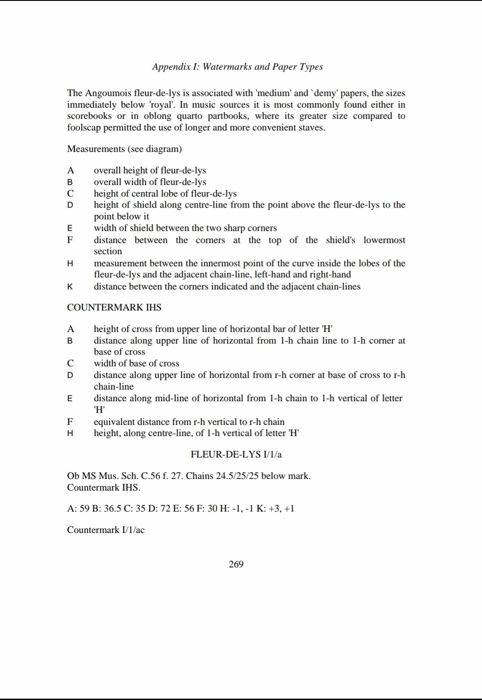 sheet: 288 x 398 mm. 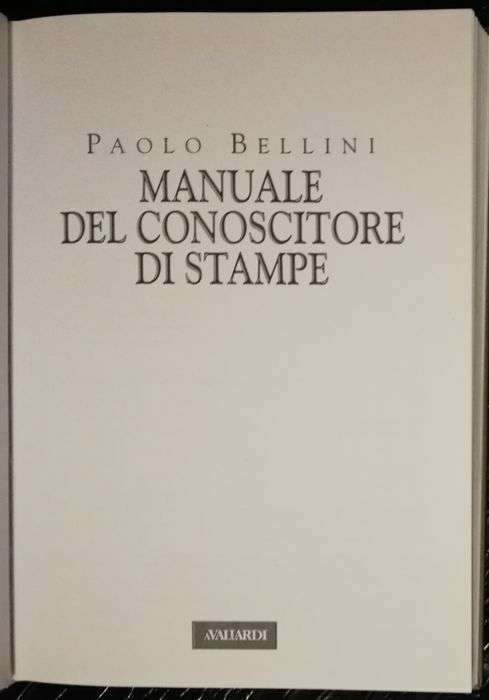 The state of conservation is very good, as shown in the attached photo images. 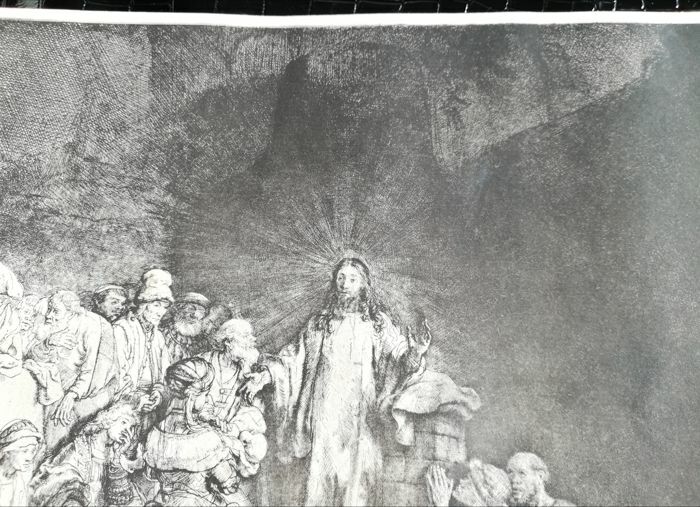 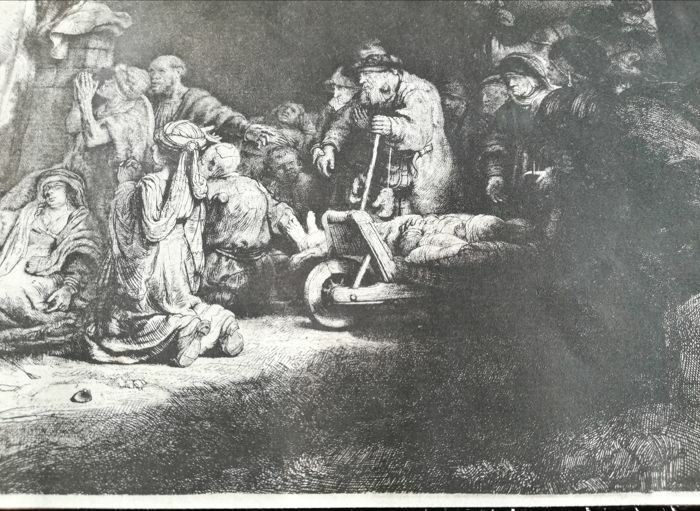 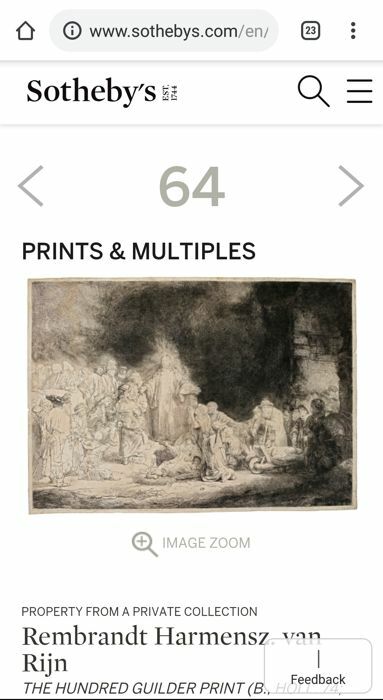 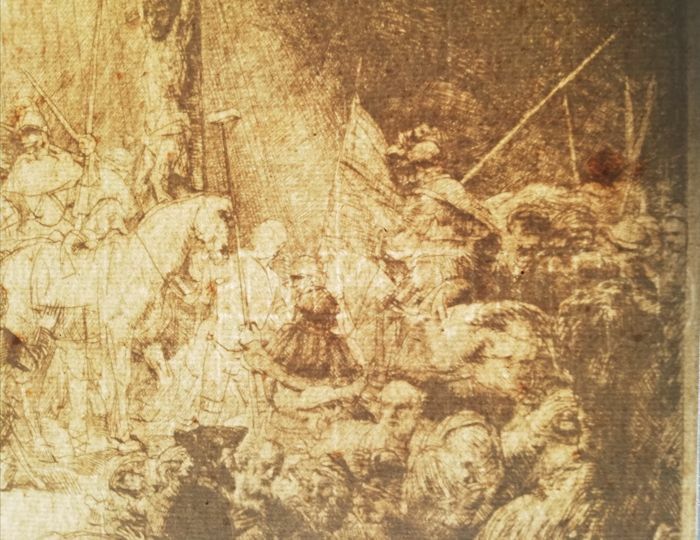 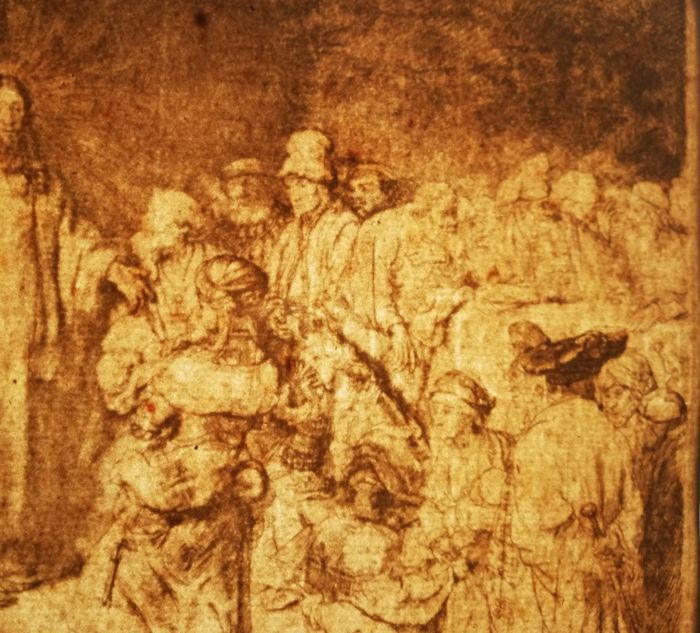 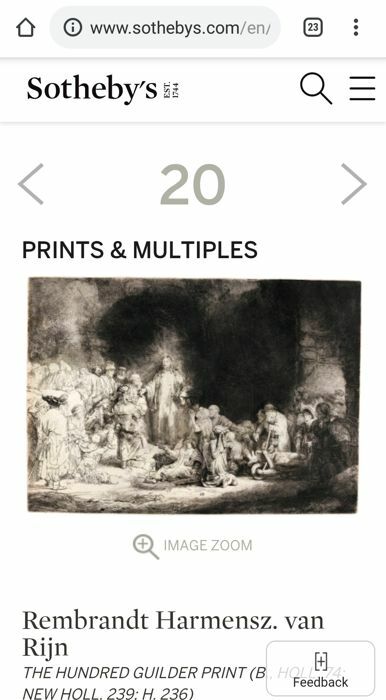 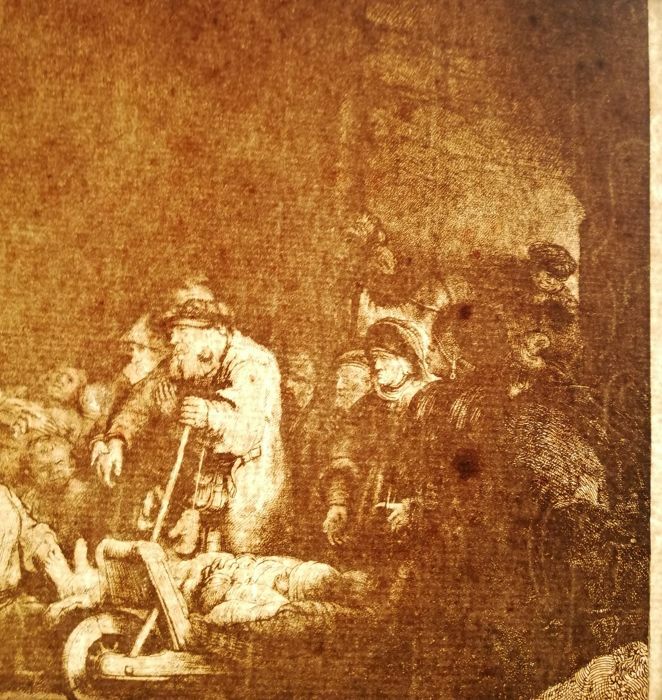 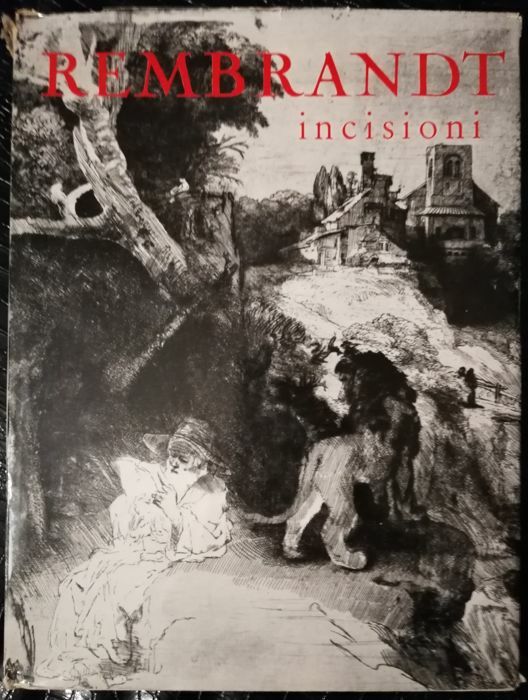 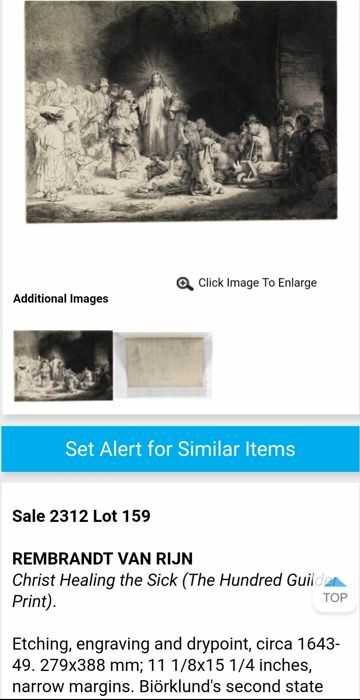 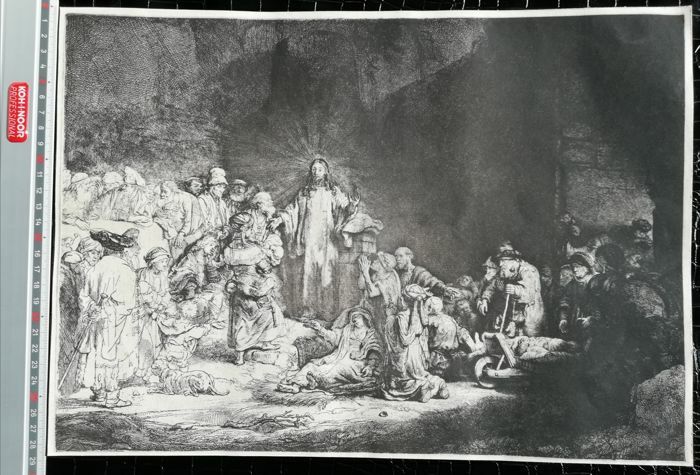 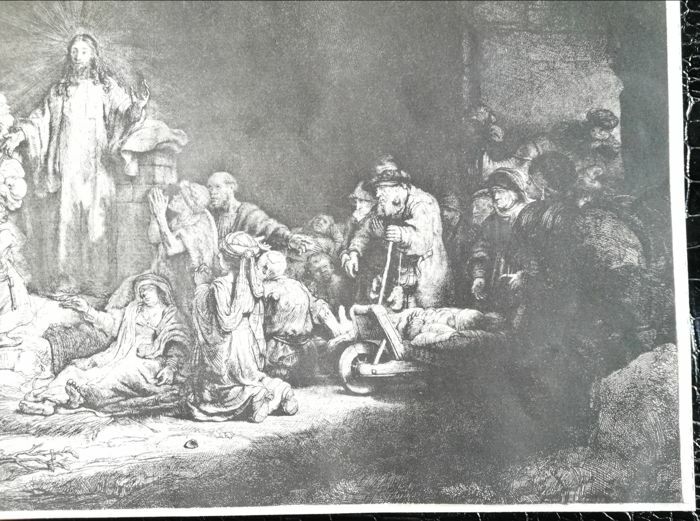 The group of figures at the left side of the print, for example, is deftly indicated with a minimum of lightly bitten lines; in contrast, the evocative richness of the blacks and the depth of tone in the right half of the print represents Rembrandt's experimental competition with the newly discovered mezzotint technique. 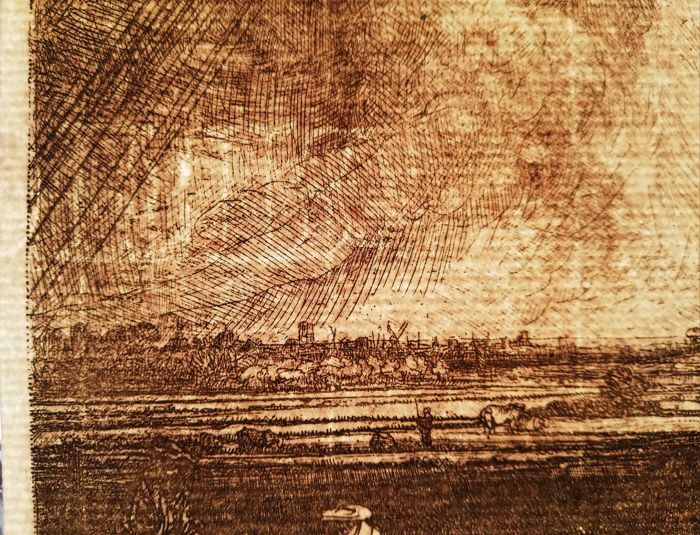 Etching with drypoint and engraving, 1649ca., an impression of New Hollstein's second state (of four), printing before Captain Baillie's rework, on paper watermarks. 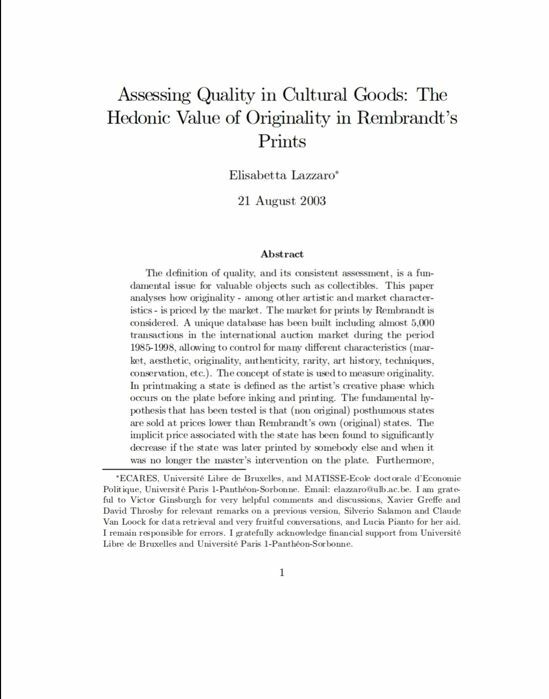 There are five different proofs of this piece. 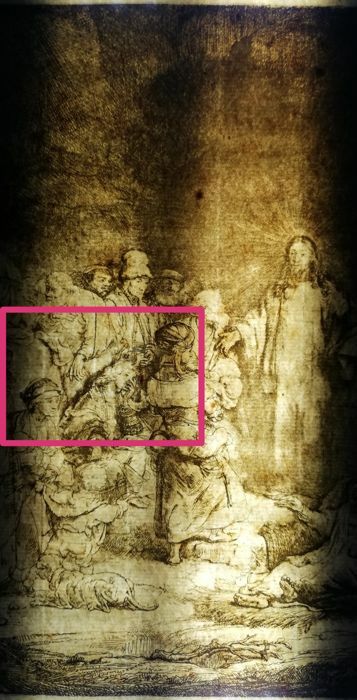 there is a sort of vault in the back, above the head of Jesus Christ. 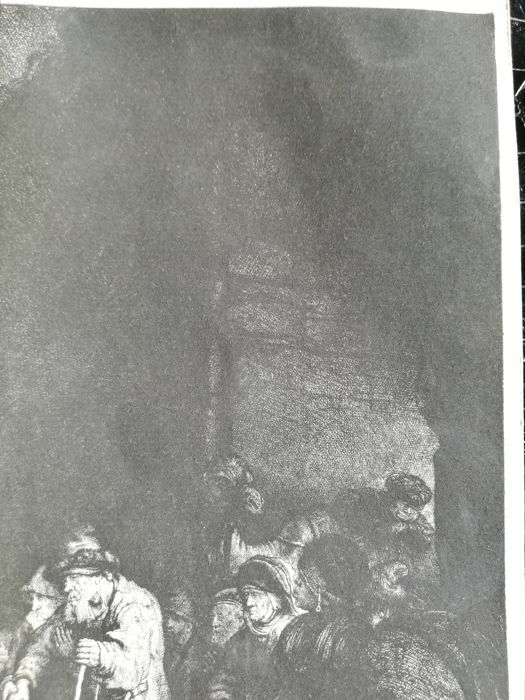 The bottom is retouched, so that we no longer see this vault. Entirely retouched by Captain Baillie. 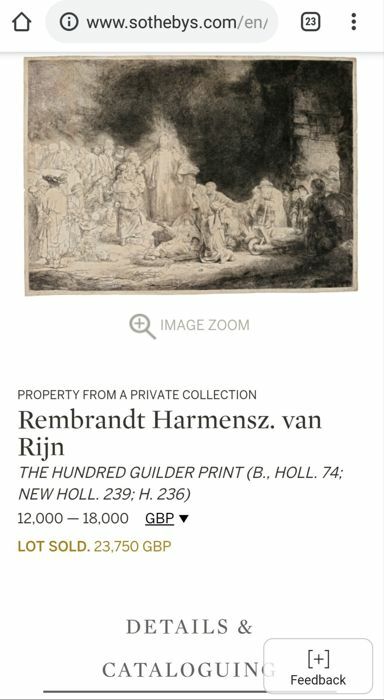 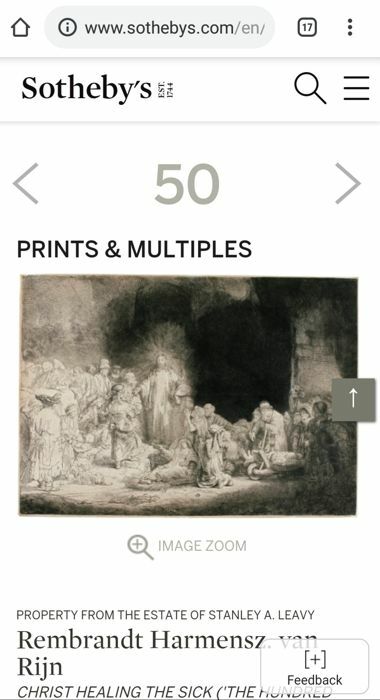 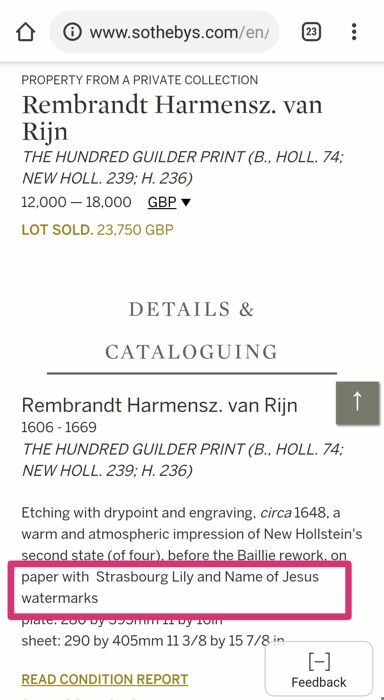 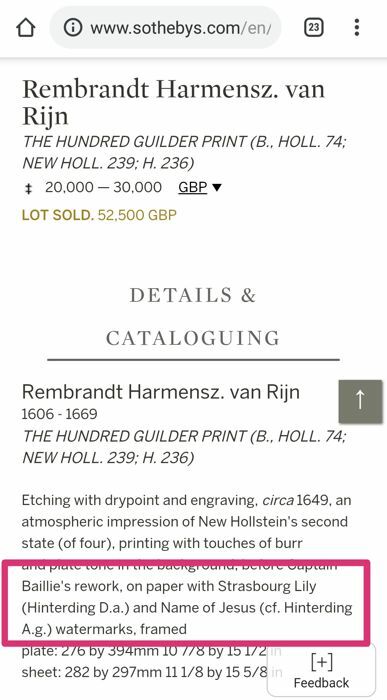 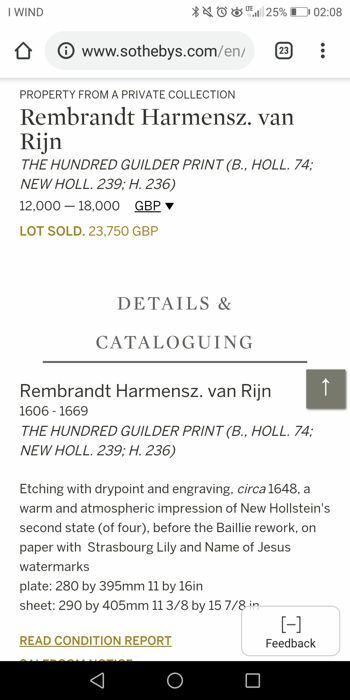 Rembrandt worked on the Hundred Guilder Print in stages throughout the 1640s, and it was the critical work in the middle of his career, from which his final etching style began to emerge. 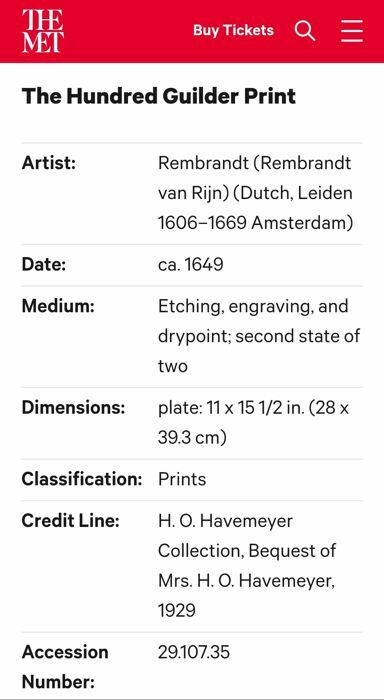 He probably completed it in 1649. 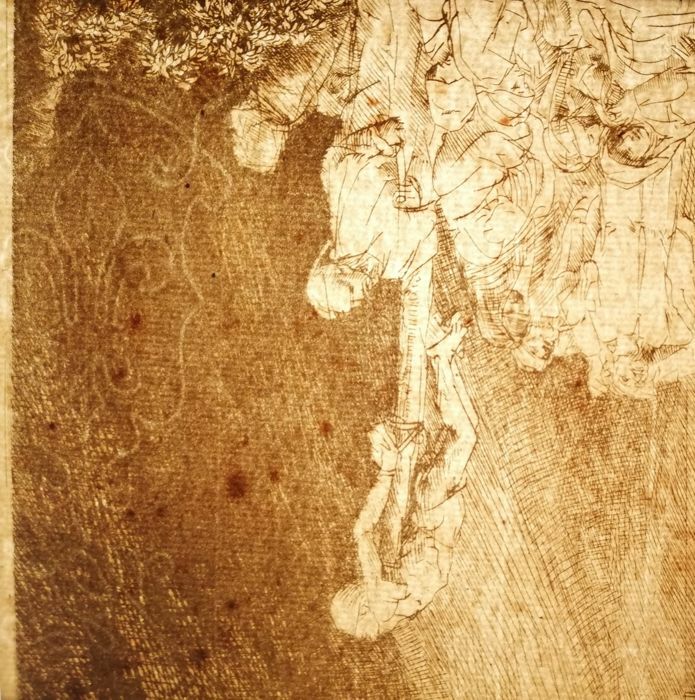 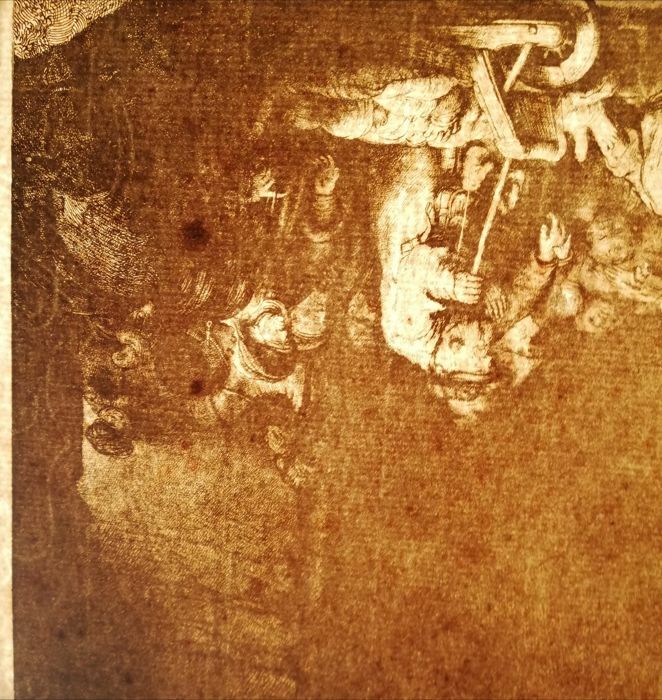 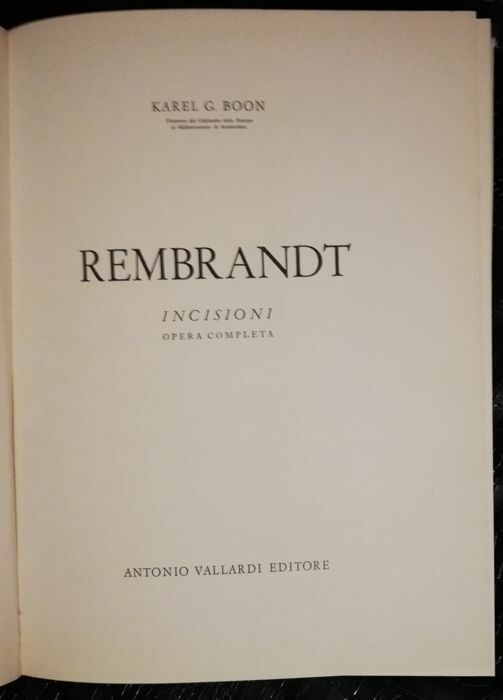 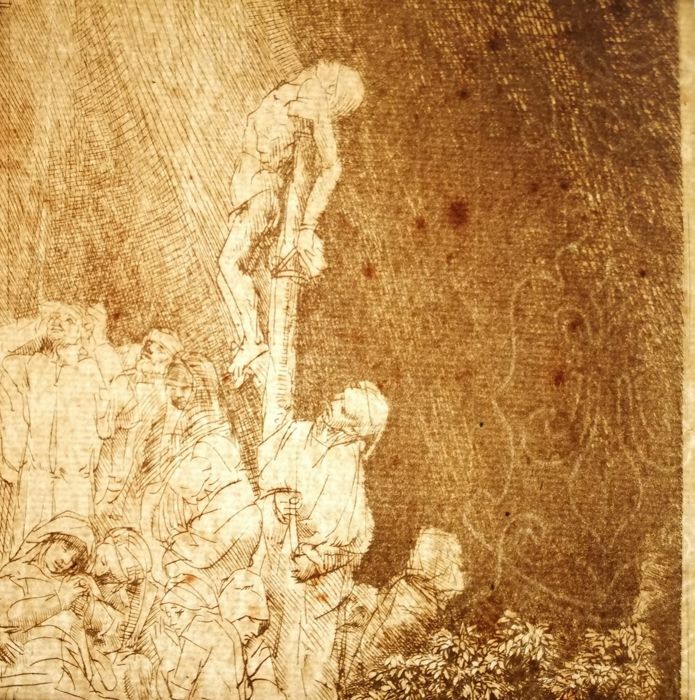 Although the print only survives in two states, the first very rare, evidence of much reworking can be seen underneath the final print and many drawings survive for elements of it. 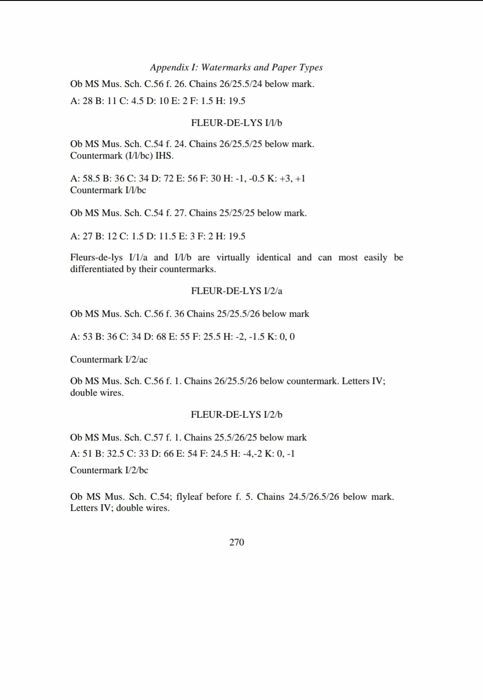 in the left part, partial written in block letters. 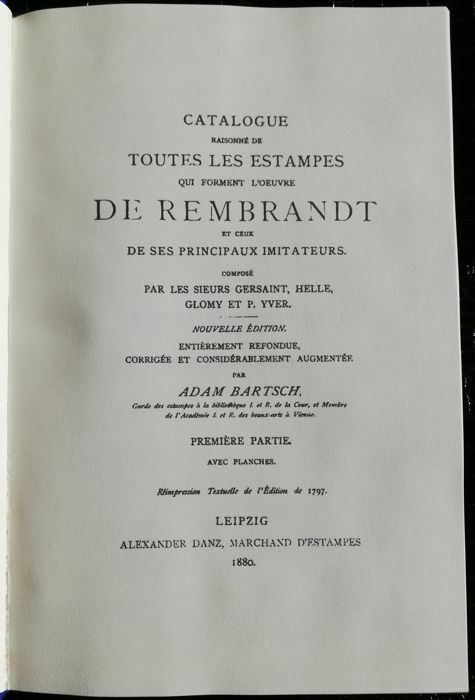 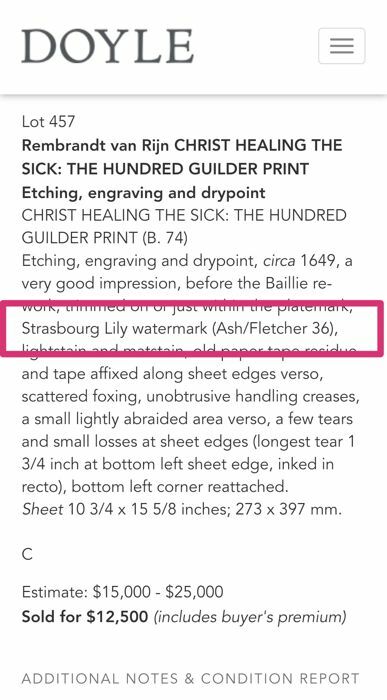 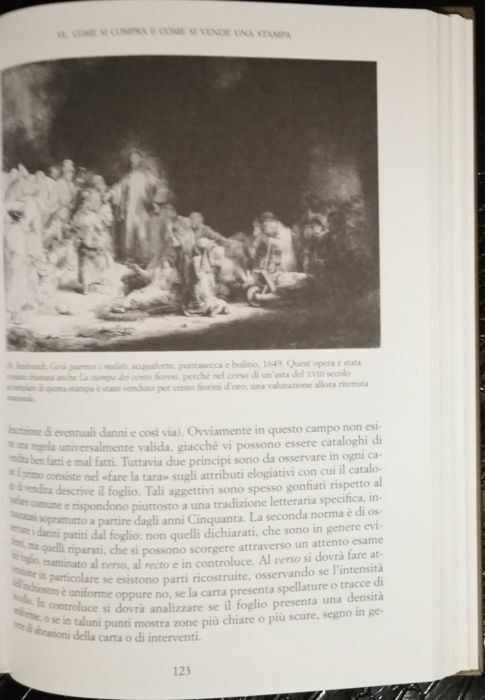 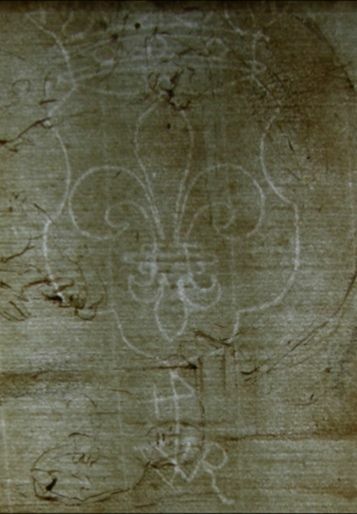 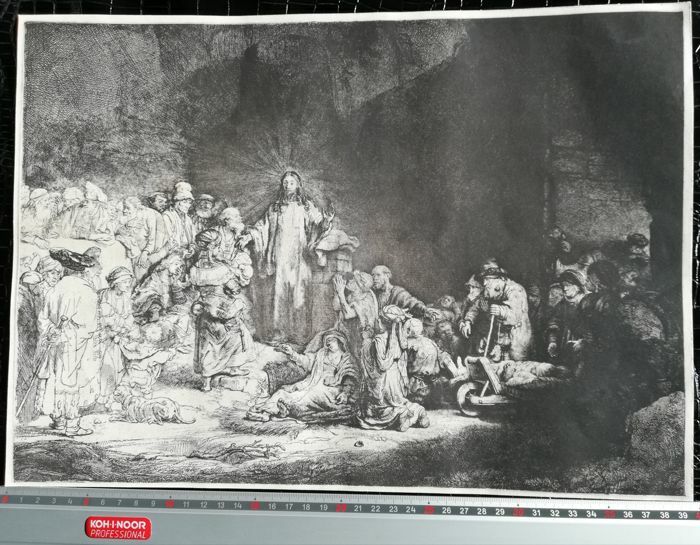 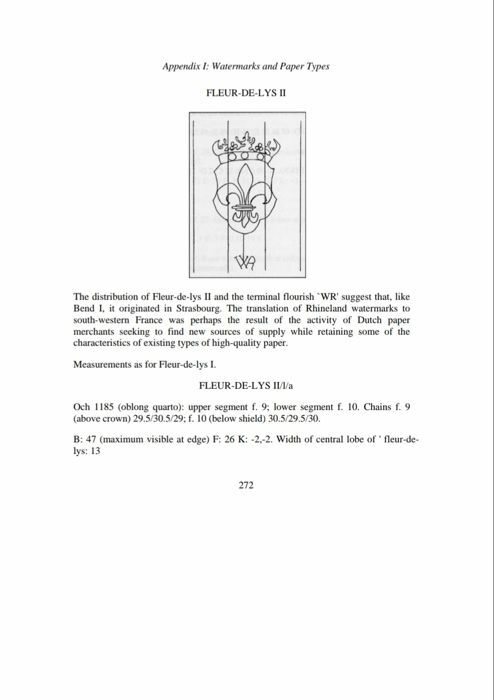 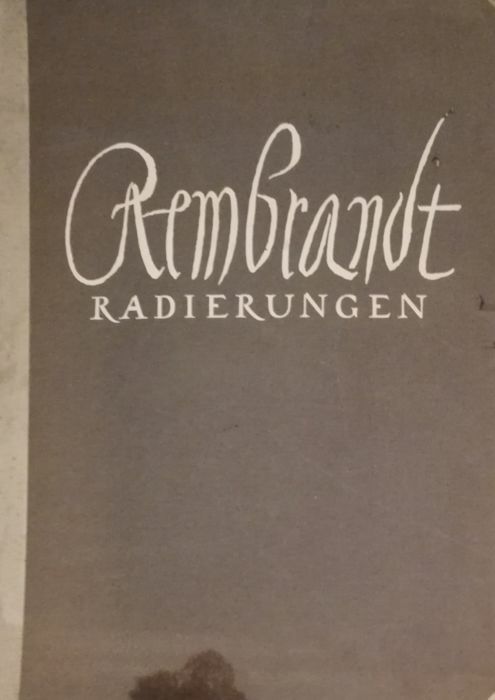 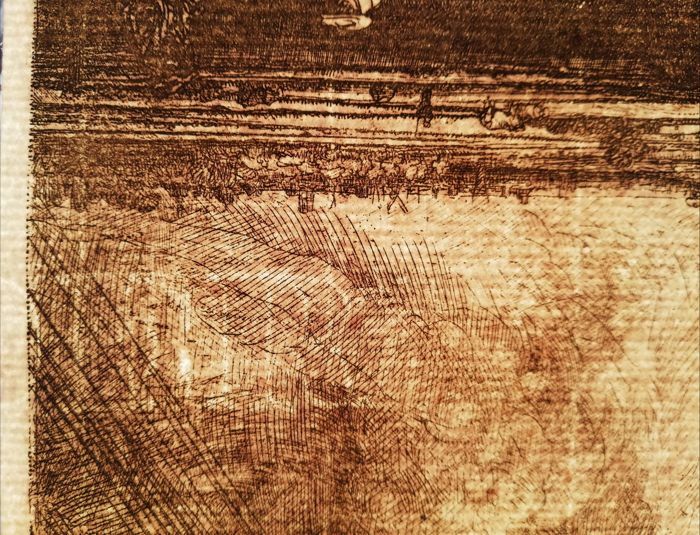 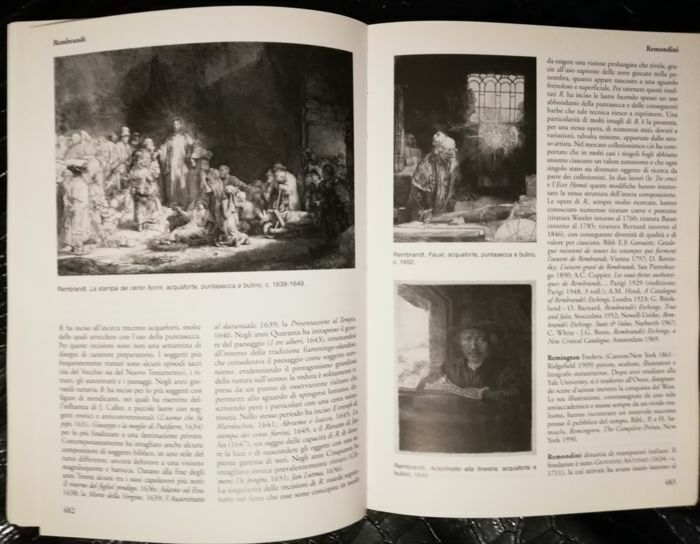 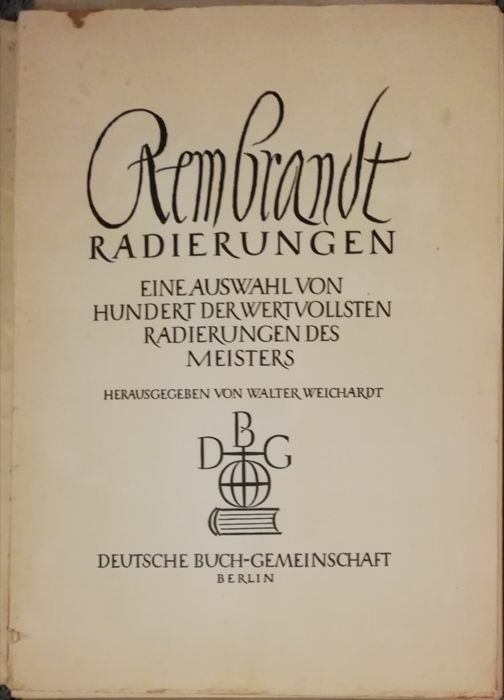 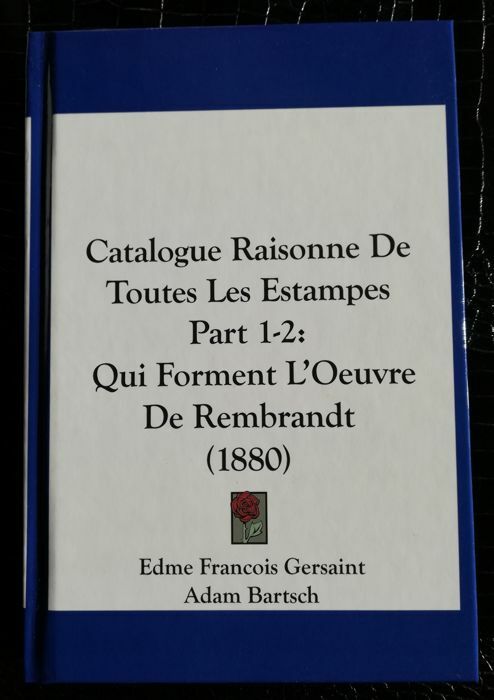 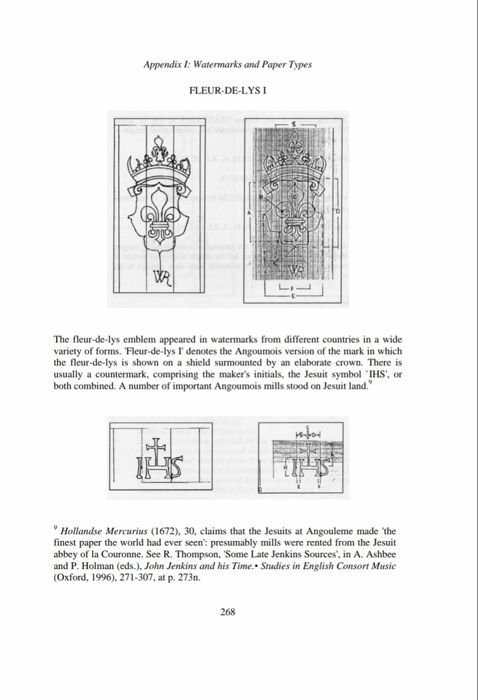 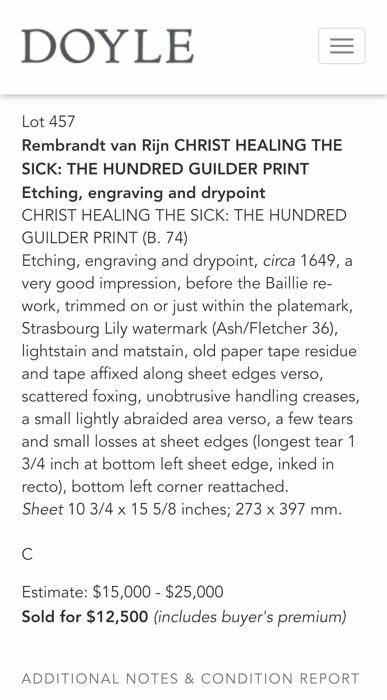 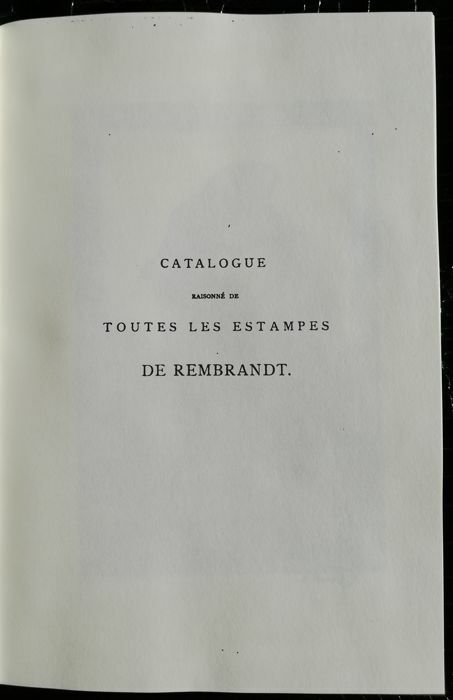 Images of printing parts are printed with backlit watermarks, and similar images of equivalent watermarks on prints of the three trees and three crosses are also published. 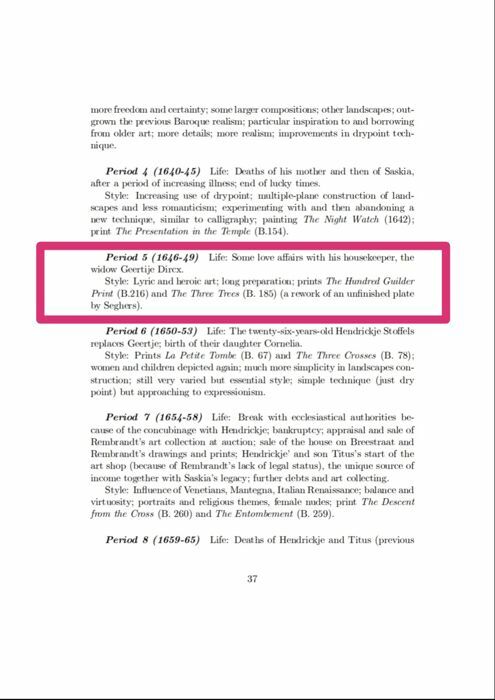 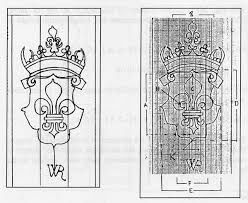 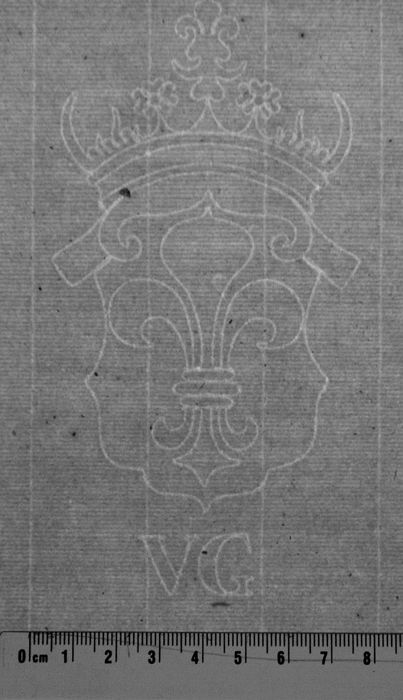 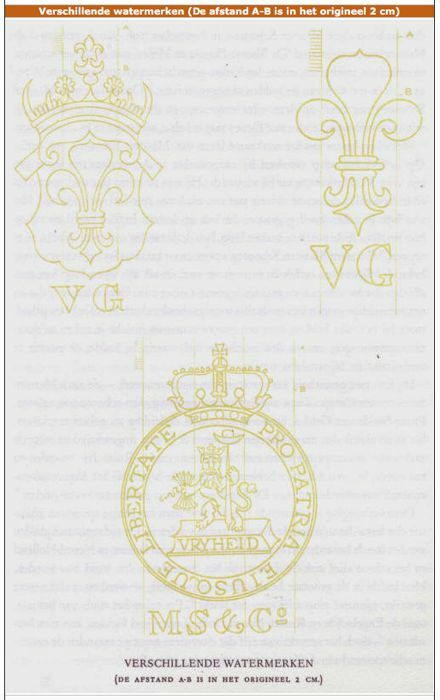 The lily in the crowned shield can be assimilated to the Strasburg Lily watermarks or Van Gelder Zonen even for the inscription in block letters. 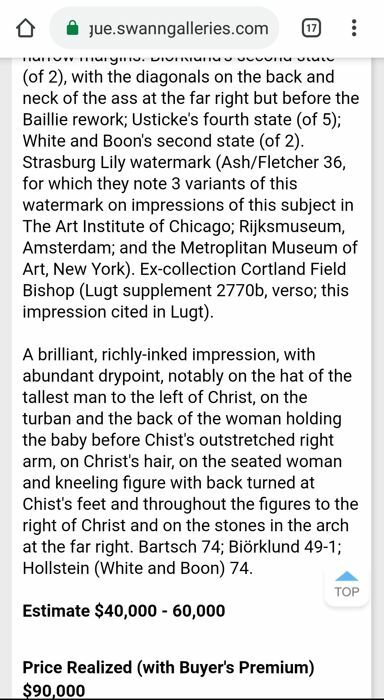 PERFECT DESCRIPTION AND QUICK DELIVERY. THANKS A LOT ! 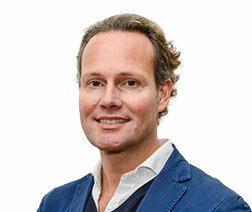 Ik had gedagt om ook een certificaat te ontvangen ?? 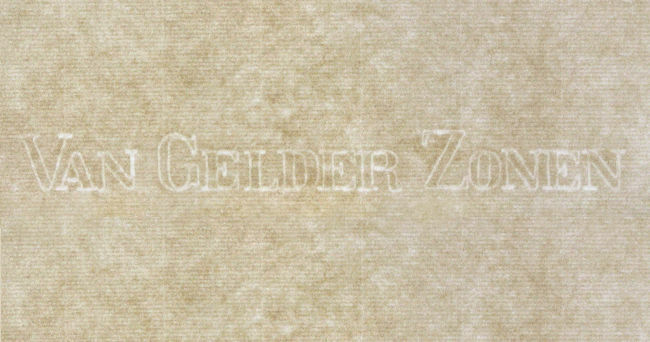 Reeds feedback gegeven. 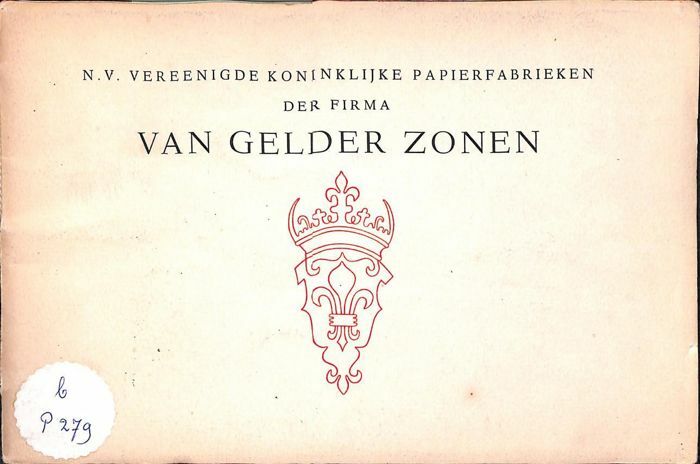 Alles is prima verlopen en zijn zeer tevreden over de vlotte afhandeling. 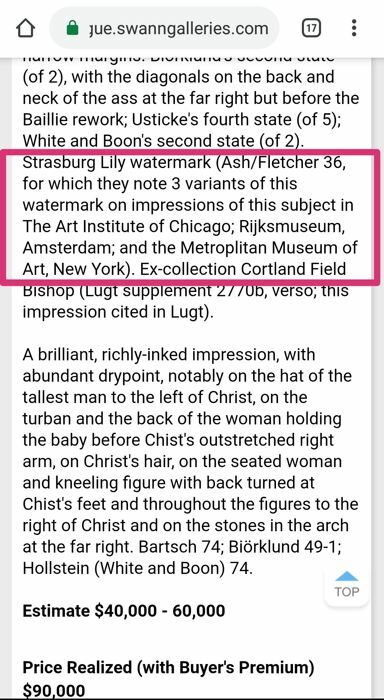 The delivery was wrapped with care and in good condition! 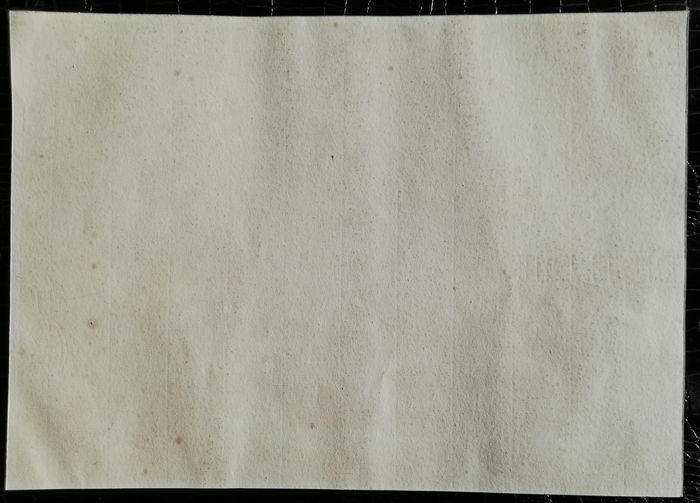 Muy bien empaquetado, y en perfecto estado. 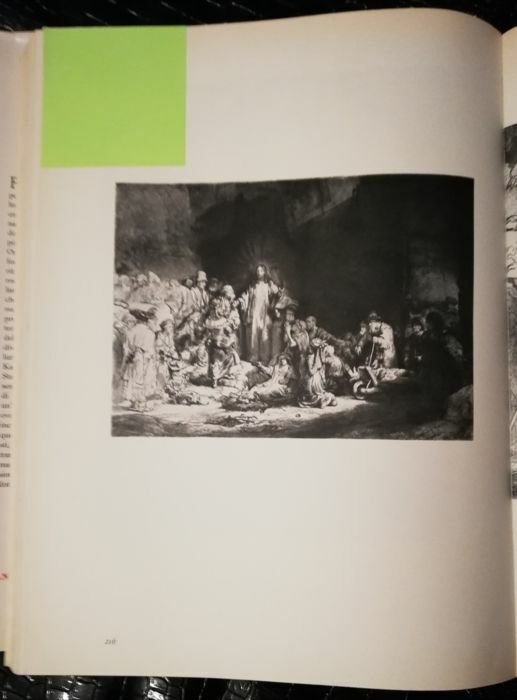 Lo recomiendo muy positivamente. 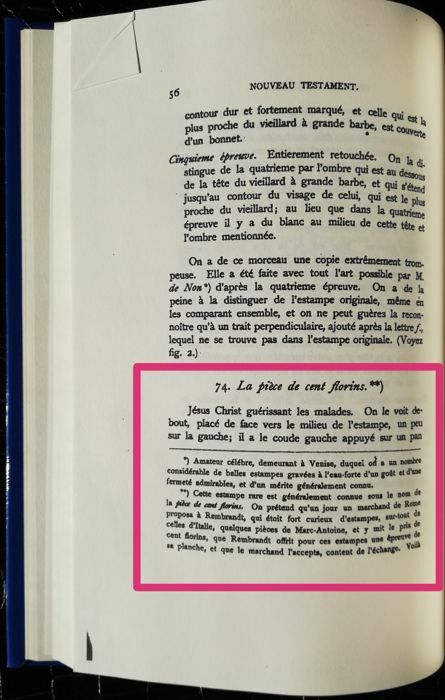 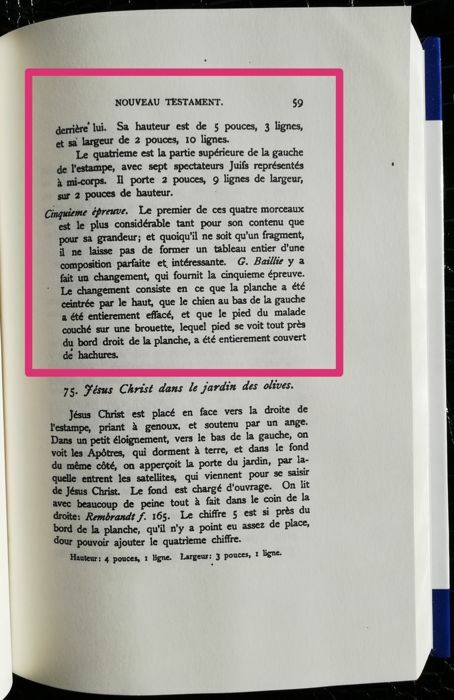 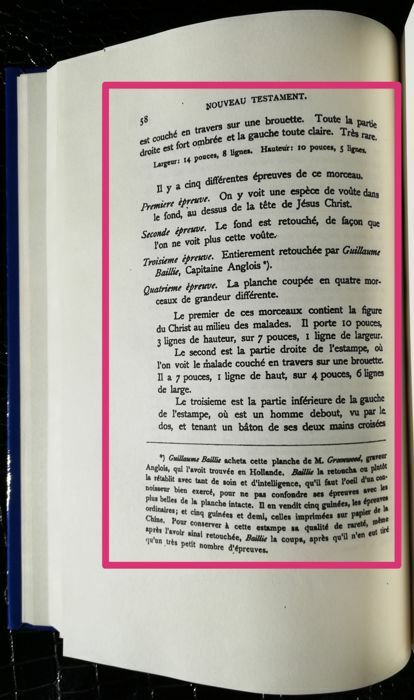 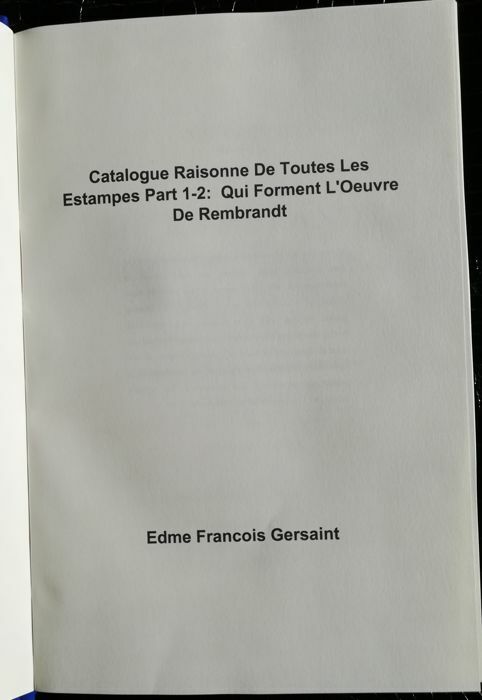 Vendeur parfait : hyper précautionneux dans l'emballage de l'oeuvre, attentif au bon suivi du colis et sympathique dans les échanges. 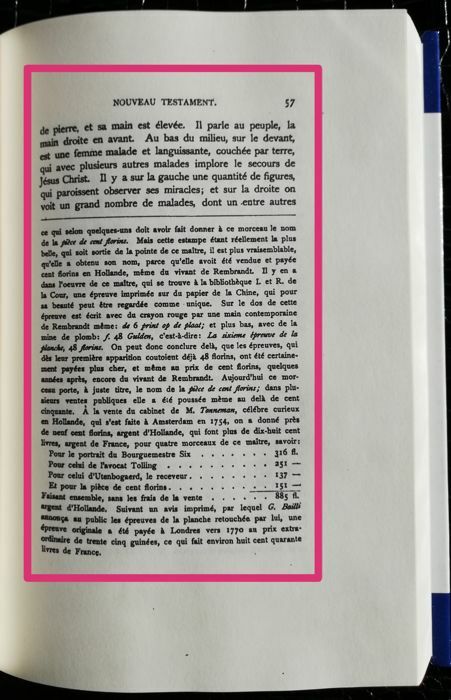 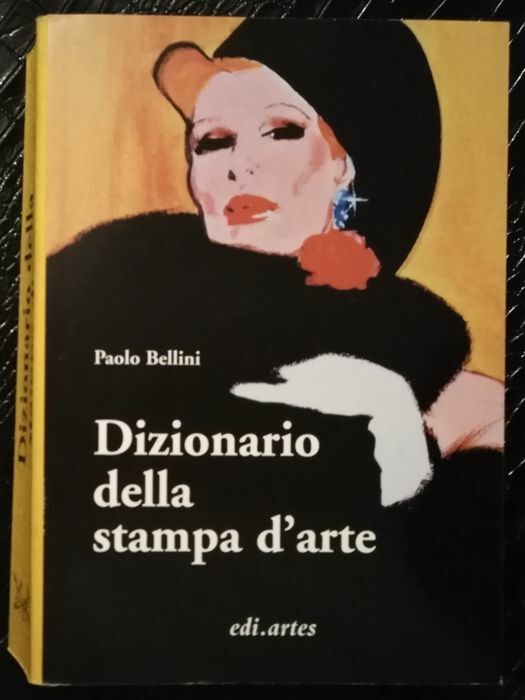 L'idéal !